Each LUX Oak Bottle requires 1 hour to be fully laser etched. This fully laser tattooed Oak Bottle is an oak vessel that accelerates the traditional oak aging process and allows anyone to customize their favorite wine, spirits, beer or cocktails by infusing extravagant oak aged flavors and aroma in a matter of hours not years. Includes: 1 LUX “Illusive” Oak Bottle, 1 etched cork top, barrel wax, 1 coaster, 1 batch ID tag, and retail tube packaging. Introducing, our most luxurious Oak Bottles yet, the LUX Editions. 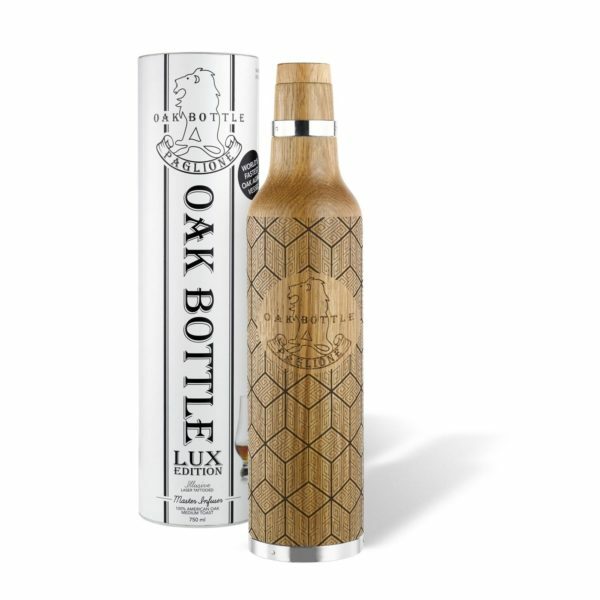 Each LUX Oak Bottle requires 1 hour to be fully laser etched. This fully laser tattooed Oak Bottle is an oak vessel that accelerates the traditional oak aging process and allows anyone to customize their favorite wine, spirits, beer or cocktails by infusing extravagant oak aged flavors and aroma in a matter of hours not years.